The role of context in cognition or intentionality has been studied in disciplines ranging from phenomenology to philosophy of mind and language to cognitive science. Here I propose to appropriate and adapt parts of Aron Gurwitsch’s analysis of “marginal” and “thematic” consciousness. 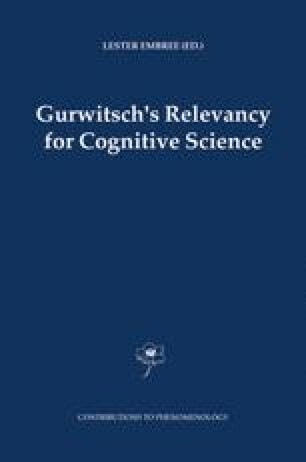 Gurwitsch factored the “field of consciousness” into Theme, Thematic Field, and Margin, and he distinguished three “orders of existence” in Stream of Consciousness, Embodied Existence, and Perceptual World. I propose to rebuild these distinctions as linked structures of intentionality: formal meaning (noematic) structures defining focus of attention, and formal objective structures defining context of experience. The analysis will clarify results in cognitive science concerning “inattention blindness.” My larger aim is how to analyze intentionality as a “formal” ontological structure within a framework of formal ontology.